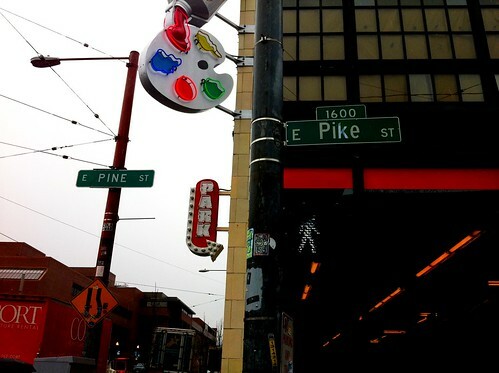 Like I don’t have enough trouble remembering the difference between Pike and Pine. hahahaha! This has to be one of the best ever AFD pranks! Just saw on Cupcake Royales Facebook they hit up the sign in front of there place. GO to their Facebook to see Pic! I am so sick of these anarchists who smash our stores and write on our walls and change our street signs! Sure this is all funny until you get lost when you’re iphone that mommmy and daddy pays for tells you to turn on pike and you turn on pine because someone VANDALIZED the sign (a crime!) and your wind up on the wrong side of the tracks and mugged! See how fast you change your position on the cops then! I hardly believe that this prank is going to direct someone to “the wrong side of the tracks” seeing as they are only a block from one another you are just as likely to be mugged on Pike as you are Pine. And really, come on, it’s FUNNY..anyone who has lived in Seattle can appreciate the humor in the Pike/Pine which is which. Sitting at Quinns looking at a Pine St. sign. Priceless. This has nothing to do with anarchists, smashing stores or the cops. Or iPhones or parents. It’s like you’re lumping every single thing that frustrates you into one bundle of nonsense and tossing it at this prank. It’s a joke, pinheads. He/she’s goofing on a previous thread from a few days ago. PiNe (with an N) is North of Pike. But then…you have to know which way is North.